EBG is leading in the development of non-inductive thick film power resistors that are particularly compact and powerful. 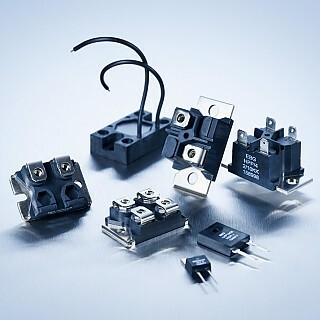 These resistors regulate power peaks, such as those that occur when high-end electronic devices are switched on and off, and they divert power surges. They also help regulate the rotational speed of electric motors such as those used in industrial equipment and in vehicles like trams and locomotives. In offshore wind farms and substations, they assist in effecting the transmission of energy produced on direct current basis. Leading manufacturers of electric motors, medical equipment and frequency converters rely on our power resistors because of their powerful performance and the long-term operating reliability. - 18 W Thick Film Power Resistors for high-frequency and pulse-loading applications. Single screw mounting. - 20 W Thick Film Power Resistors for high-frequency and pulse-loading applications. No mounting hole (snap-on). Heat sink required. - 100 W Thick Film Power Resistors for high-frequency and pulse-loading applications. Version B for enforced mechanical stability. - 35 W Thick Film Power Resistors for high-frequency and pulse-loading applications. Single screw mounting. - 35 W Thick Film Power Resistors for surface mount including metal tab. MHP 35 for high temperature soldering! - 50 W resistors with up to 4 wire terminals. - 100 W resistors with 4 wire terminals, Version B for enforced mechanical stability. - 120 W power resistor in "ISOTOP" power device. 6 different layouts available. Mounting to heat sink is required. - 150 W power resistor according to VDE 0160 and UL 94-V0. 4 different layouts available. Easy mounting to heat sink. - 180 W power resistor according to VDE 0160 and UL 94-V0. 4 different layouts available. Easy mounting to heat sink. - 150 W power resistor - only configuration 1 possible. Easy mounting on heat sink. - 200 W resistor in "ISOTOP" power device. 5 different layouts available. Easy mounting to heat sink. - 600 W resistor at 85°C bottom case. 5 different layouts available.